Sorry for the delay. I got sidetracked by those having a hard time accepting that Ocean Heat Content uptake has slowed. 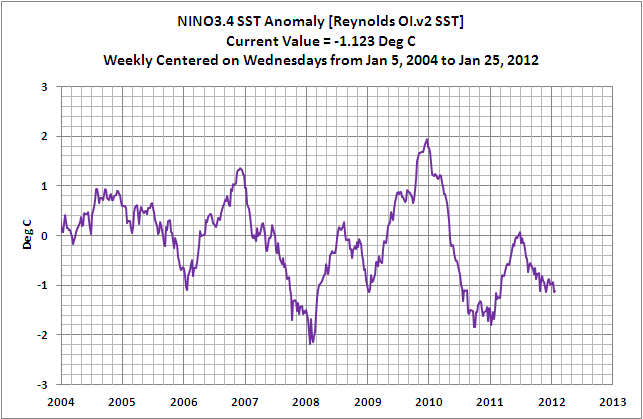 The January 2012 Reynolds OI.v2 Sea Surface Temperature (SST) data through the NOAA NOMADS website won’t be official until Monday, February 6th. Refer to the schedule on the NOAA Optimum Interpolation Sea Surface Temperature Analysis Frequently Asked Questionswebpage. 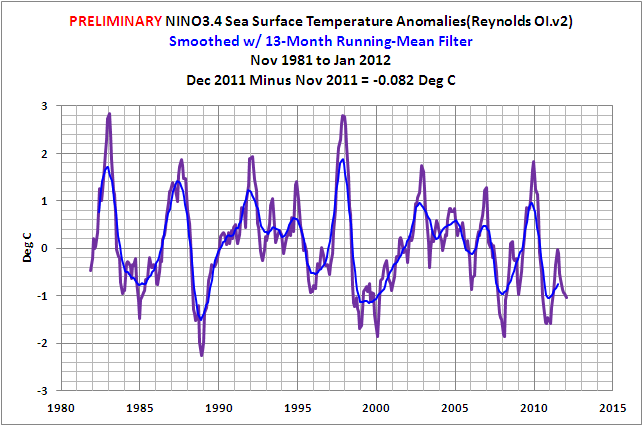 The following are the preliminary Global and NINO3.4 SST anomalies for January 2012 that the NOMADS website prepares based on incomplete data for the month. I’ve also included the weekly data through the week centered on January 25, 2012, but I’ve shortened the span of the weekly data, starting it in January 2004, so that the variations can be seen. Based on the preliminary data, Monthly NINO3.4 SST anomalies are at -1.03 deg C. Monthly NINO3.4 SST anomalies are still bouncing back and forth at the threshold of a moderate La Niña. One would expect them to start rebounding next month. The preliminary global SST anomaly has dropped to +0.029 deg C.
The weekly NINO3.4 SST anomalies for the week centered on January 25, 2012 are still not showing any signs that the La Niña is weakening. 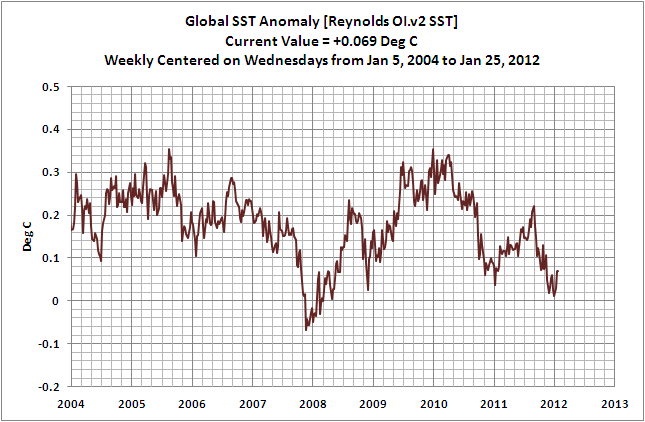 They are at -1.12 deg C.
Weekly Global SST Anomalies have rebounded. They are presently at +0.069 deg C.
Could you add a 3rd order polynomial fit to the data in these graphs (for entertainment purposes only) ? Sun Spot: I’d prefer not to add the poly trend. 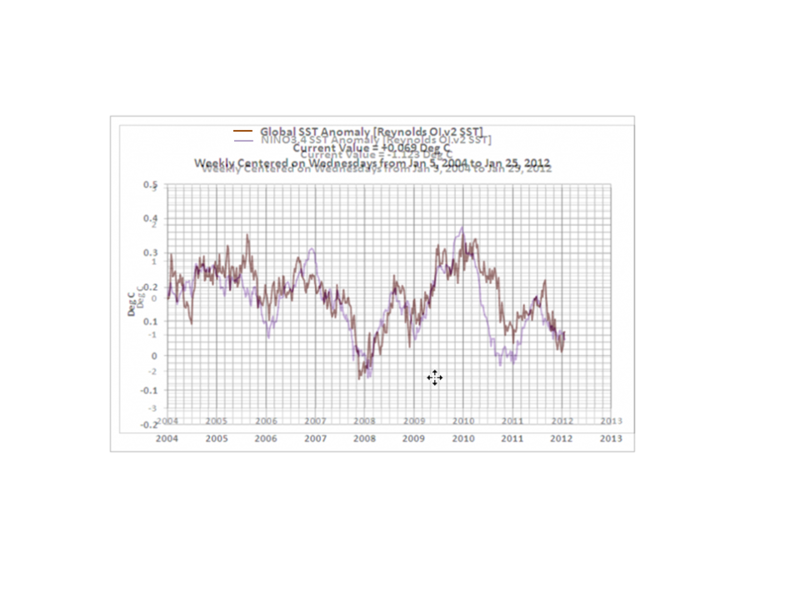 Looking at the monthly Global data, it’s pretty clear which way global sea surface temperature anomalies appear to be going since 2004-ish. 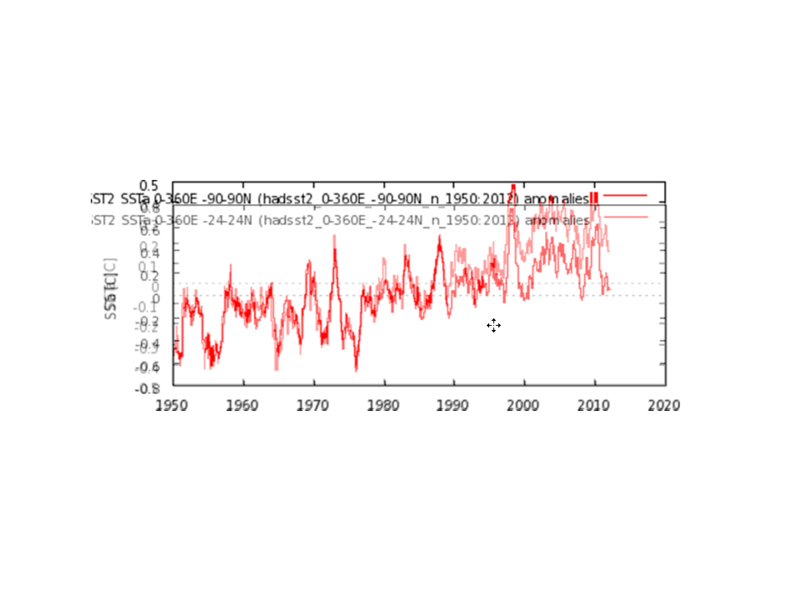 I remember having seen various tipping points, one from the activity from the sun, going down at around 2003 and another of earth’s albedo, seemingly increasing from about 2003. Curiously enough the albedo measurements (via the moon) seemd to have stopped in 2007. For example, lets say we magically increased air temps a degree holding everything else constant (absurd, I know) how much heat would the ocean aquire? Is it insignificant considering the heat capacity? Is it insignificant considering the evaporation? Are these observed or modelled quantities? If you or any of the learned readers can offer help or links I would be most greatful. Dave still learning: I don’t believe I’ve ever run across a paper that describes the surface air temperature warming the ocean. 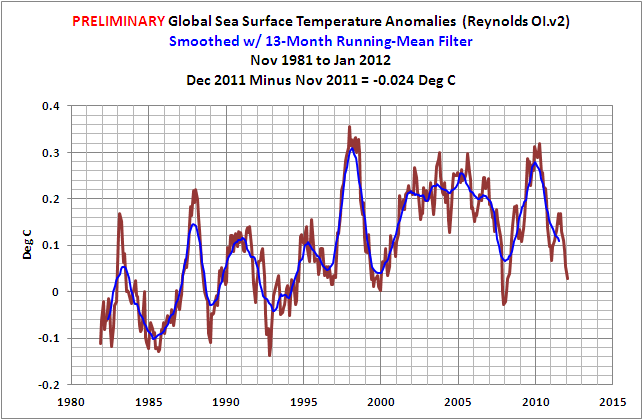 Also, Marine Air Temperature has a lower trend than Sea Surface Temperature. The only place where Marine Air Temperature rises faster than Sea Surface Temperature is in climate models. 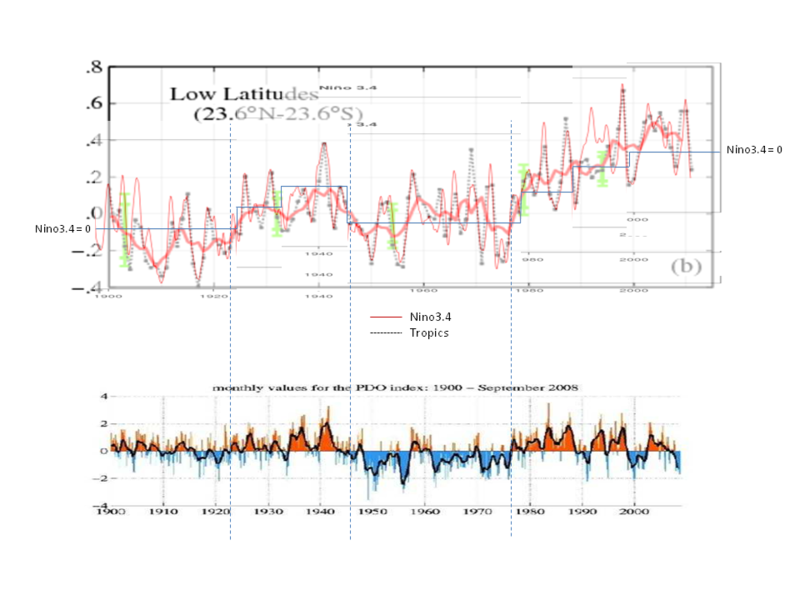 lgl: The steps show in the monthly data for the Atlantic-Indian-West Pacific data (90S-90N, 80W-180), not the global data. Thanks Bob, very useful graph. The tropics don’t represent the globe. And I don’t see the clear steps in your link. I’ll disregard the taunt about the PDO. Nit-picking. The shapes are the same, just a bit bigger jumps in the global. And I don’t see the clear steps in your link. I still would be hard pressed to see them in the data without the blue lines. Are the blue lines average temperatures for the periods? Nino3.4 is offset in steps to match tropical.